The scant remains of the Parthenon canvas the Athens skyline. Photo by Molly Hayden, USAG Bavaria Public Affairs. 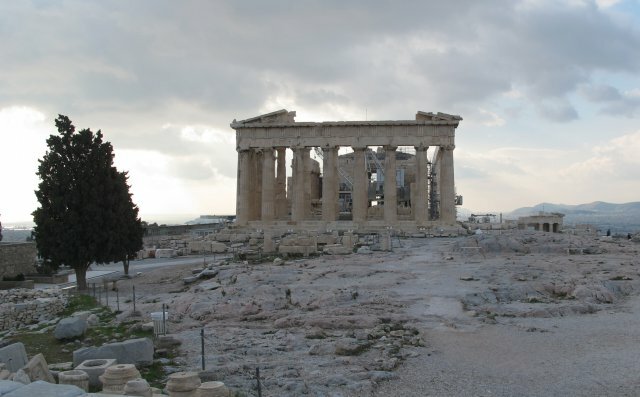 ATHENS, Greece — Influences of American and European culture as we know it started centuries ago with toga-clad Greeks as they meddled in mathematics, dabbled in democracy and flirted with philosophy, creating an unprecedented civilization. Advances to the technological age could not have happened without our neighbors to the south. And while Greece, particularly Athens, hasn’t been on the right side of the media lately, according to many locals that were more than willing to talk about the current economic crisis, Greece isn’t perishing. The protests are peaceful, the riots nonexistent, and the economy is slowing moving … what direction is yet to be determined. Regardless, winter is a great time to travel to Greece as the prices are cheap; the sun always shines, the locals are welcoming, and centuries of history stares inquisitive historians right in the face – without the overcrowded background of other tourists. Probably the most well-known and ancient site in the Western world is the Parthenon on the Acropolis. Perched 490 feet above sea level, it is the largest Doric temple in Greece and graces the skyline from every view point of the city. The temple was a masterpiece of its day, dedicated to the goddess Athena. Construction started in 447 B.C. and took nine years to complete. The Parthenon was architecturally sound for centuries as the temple traversed into a Catholic church, then a mosque when Greece was occupied by the Romans and the Turks, respectively. In 1687, a cannonball hit the Parthenon, which was being used to house Ottoman ammunition, causing major structural damage and reducing it to the structure that stands today – largely in ruins, without a roof and dilapidated, but still impressive. The National Archaeological Museum is by far the world’s best collection of ancient Greek art, displayed chronologically from 7,000 B.C. to A.D. 500. Take a few hours and wander from the Cycladic Island to the Mycenaeans, cruise through the Archaic age and enter the Classical Period, rounding out the trip in the Bronze Age. Photos without a flash are allowed in the museum, but beware: Visitors who try to pose like Poseidon – triton in hand in front of the display – will be reprimanded. Only a few years old, the New Acropolis Museum is already making a name for itself as one of the highest-profile cultural projects of Europe in this decade. The structure of the museum grounds showcases 226,000 square feet of glass and concrete with a hanging price tag of $200 million dollars. Glass sidewalks give way to archaeological finds below, revealing excavated Athenian history including homes, bathhouse and workshops – believed to be from the fifth century. The museum itself houses 4,000 artifacts with an in-depth history into the Parthenon, displaying original statues from the temple’s façade of yesteryear. Models of the Acropolis as it stood centuries ago give sustenance to the imaginations of visitors as they begin to understand and visualize the impressive architectural developments of the ancient civilization. While walking through the sparse remains of the Ancient Agora, (which means “gathering place”) it’s easy to envision the hustle and bustle of this marketplace centuries ago. The Agora was once the heart of ancient Athens. Located northwest of the Acropolis, Ancient Agora is now the center of archaeological study and a top tourist attraction. The rectangular structure has been beautifully remodeled and a modest museum adorns the site. The hustle and bustle of modern times has moved to the Agora on Athinas Street, otherwise known as the Athens Central Market. Fisherman, farmers and butchers vie for the attention of passersby as they hock they wares. Fish wiggle around on ice, freshly dismembered meat drips from the ceiling and sticky figs blanket small tables. Across the street, fresh fruit and vegetables create a stark, colorful contrast, allowing locals a one-stop shop for a well-rounded meal. From pickled fish, pig’s feet and more olives than one could ever consume, look to the Central Market for that out of the box souvenir. The smell may not be inviting, but the atmosphere more than makes up for it. For another glimpse at the here and now, head to Monastiraki Square. It’s famous for Saturday night dance parties in the street and the Sunday morning flea market. Peruse tiny streets for souvenir shops, specialty stores and clothing boutiques – a great place for bargain shopping. It’s touristy, yes, but the Plaka district offers a night on the town Greek style. Music pours out on the streets catching the ear of anyone walking by. Hesitate for a moment to listen and a restaurant owner will shuffle you into his establishment and fill you up with mezzas and Ouzo before you realize what is happening. Greece never fails to intrigue with its superior scenery and tasty cuisine. Walking through Greece is like walking through history with a modern-day twist, and Athens is a perfect marriage of old and new.